A decade is a significant length of time by any measure, whether you’re talking about accelerating divorce rates or playing in a rock and roll band. Add to that the fast-paced changes initiated by technology and a decade can feel like a lifetime – or, in the case of Los Angeles rockers Sasquatch, a turbulent yet accomplished career. After bursting onto the stoner rock scene with, not one, but two, closely packed studio albums (conveniently named Sasquatch I and II) in 2004 and ’06, the power trio went subterranean until 2010 before resurfacing with a new lineup and propulsive third opus (entitled, you guessed it, III), to the relief of many impatient fans and the Small Stone Records Board of Directors. More importantly though, this career-establishing trilogy managed to seduce consumers and critics: beginning with the debut’s roaring-down-the-highway riffs, hypnotic grooves and occasional forays into southern rock; continuing with the sophomore LP’s increasingly focused, hook-laden hard rock classicism (standout “Barrel of a Gun” lacked only payola to become a massive radio hit); and culminating in the third album’s heightened states of fuzz-distortion and earth-rumbling power chords, capable of reducing Marshall stacks to so much plastic pudding. All the while, Sasquatch steadily brought their advanced heavy rock ‘theories’ to the people, as they demolished stages across the globe alongside the likes of Blue Cheer, Nebula, Unida, Solace and Fatso Jetson, to name but a few. Most recently, the band was sighted marauding across Europe with Small Stone label mates Roadsaw & Dixie Witch. 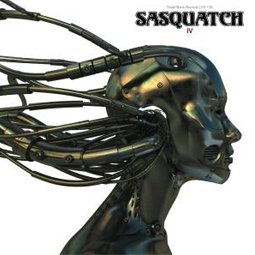 Meanwhile, Sasquatch’s music has been tapped to soundtrack everything from movies (Jersey Girl), to television shows (FX’s Sons of Anarchy, A&E’s Dog The Bounty Hunter, the CW’s The Supernatural, and MTV’s Viva La Bam), to video games (NHL 2005, American Chopper, and Monster Garage). Now the time has finally come for Sasquatch members Keith Gibbs (guitar, vox), Jason Casanova (bass) and Rick Ferrante (drums) to deliver a brand-spanking new album, whose chosen title – IV – was as inevitable as the urgent need shared by discerning fans of superior, song-oriented rock to HEAR IT – and pronto! What they will hear is arguably the power trio’s most mature, inspired and diverse song-set to date, rife with compositional twists, both heartwarmingly familiar and totally unexpected, plus thundering power chords, sizzling solos, shrewd melodic flights and even super-trippy moments – but all of it heavy on the heavy, as they say…always. To top it off, Sasquatch have upped their game where the lyrics are concerned, devoting unprecedented attention to spinning engaging new yarns out of those evergreen rock and roll stories about love lost, hate found, relationships built and lives trashed, homes wrecked, etc. All’s fair in love and doom. At the end of the day, IV’s shimmering end results reveal a real ALBUM, not just a collection of songs that happen to be living under the same roof to save a little rent money! Guest vocals on “Smoke Signal” courtesy of Gaff. Guest guitar swirls on “Smoke Signal” courtesy of Hammy. Drums and bass recorded by Steve Lehane and Al Sutton at Rustbelt Studios, Detroit, MI, in December 2012. Guitars and vocals recorded by Benny Grotto at Mad Oak Studios, Allston, MA in Q1 and Q2 of 2013. Mixed by Benny Grotto at Mad Oak Studios, Allston, MA in June 2013. Mastered by Chris Goosman at Baseline Audio Labs in Ann Arbor, MI. All songs written by Gibbs, Ferrante, and Casanova. Published by Lucy Fur (BMI), Woplak Music (ASCAP), and Music for Bearded Pirates (ASCAP).